Today's pretty jumble of ribbons of zucchini and carrot, quickly sautéed in a little butter. Easily turned vegan. Paleo. Naturally Gluten Free. Weight Watchers friendly, just one PointsPlus! At Christmas, one of the family Santas, probably my sister, tucked what I'll call a "hand mandoline" or "julienne cutter" into my stocking. Since such devices, even relatively expensive ($30, say) ones, have until now produced only frustration and disappointment, I wasn't expecting much. But this little guy worked like a charm on both the soft zucchini and the firm carrot, not perfectly, as the ends tended to get stuck, but well enough to pull out often – especially since I love the looks and the taste of the white, green and orange ribbons. It's easy to imagine substituting the ribbons for pasta, or for dropping into a big pot of soup just for the looks. If you can't find one of these devices, just use the large holes of a grater. UPDATE Alas, the handy kitchen tool from Santa pictured here disappeared along the way. I've replaced it once or twice and the replacements do work but I sure wouldn't say, "like a charm". 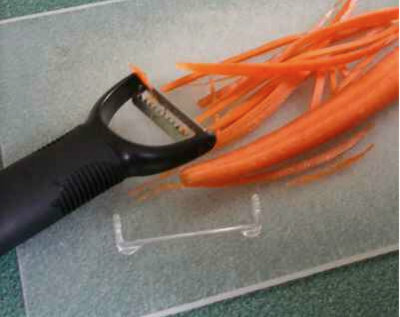 Today, I'd probably pull out the easy-to-use spiralizer for the zucchini and then use the julienne cutter on the carrots. Cut the carrots into ribbons, then in half. Heat the butter in a large skillet until shimmery. Add the garlic and the carrots, stirring to coat with fat and seasoning with salt and pepper. Let cook, stirring often while cutting the zucchini. Add the zucchini to the skillet, stirring to coat and distribute the heat, season with salt and pepper again. Cook until soft (or al dente if you prefer). Taste and adjust the seasoning. To use the ribbon cutter, keep the vegetables whole and place flat on a cutting board. Draw the cutter along one side, the whole length. Turn the vegetable over, flat-side down, this gives you more stability. Over and over, draw the cutter along the whole length, applying a little pressure, taking great care to not risk losing control of the cutter, it's very very sharp! You'll end up with some leftover ends – they were a good "cook's snack" while supper cooked! If your cutter comes with a blade guard, be sure to put it back on before putting the cutter away in a drawer. The carrots take longer to cook, that's why they go in first. Because you don't end up cooking the whole carrots and zucchini (because the cutter can't cut the last bit), the ribbons from two carrots and one zucchini add up to only about a half pound of ribbons vs the usual pound of vegetables used for nearly all recipes here on A Veggie Venture. Still, this is a very satisfying side dish, it easily feeds four. Looks like the essence of spring! Mmm, it does sound good. I'm on a bit of a carrot kick lately, and yes, you have converted me completely to the "real" carrots. Thanks for featuring my mother's famous zucchini recipe, which everyone in my family eats all summer long. I have one of those little gadgets and really enjoy it. This looks like just the dish to use it for. Wonderful. Christine ~ They were really good, part of it was the unexpected shape, which almost provided a different 'flavor'. Kalyn ~ Real carrots are fab, yes? (For anyone who's wondering, "unreal carrots" are those that are marketed as 'baby' carrots but are really just shaped big-mama carrots. They're great for snacking but have zero flavor when cooked. The price of convenience, with baby carrots, is flavor.) And I keep looking for a small packet of that 'secret' ingredient because I sooo want to try your Mum's recipe! Tanna ~ Little gadgets often disappoint. But this one's good! Could you post a picture of this "hand mandolin". Hi Rae ~ Here's the photo, thanks for the suggestion. Hi Janelle ~ I like this little one well enough but now am experimenting with a Benriner. Watch for the first results soon! can you let me know where to purchase the hand mandoline or what it is called Thanks. Hi Anonymous ~ I wish I could help. But the device came from my sister in my Christmas stocking and SHE got it as a freebie in the mail. You might check a kitchen store, see if they can help. Sorry, truly! Made this today. It was delicious and easy to make. I would make it again in a snap. The tool I got was a julienne peeler made by Zyliss if that helps anyone. I got it from the local kitchen store for a tenner.